While I’ve not quite reached the age where I’m ready for children, I often wonder what it will be like to have them around: how I’ll bring them up, how their personalities will develop and, importantly, what I’ll feed them. I want my children to understand where food comes from, how important it is, to realise that meat doesn’t just arrive pre-packaged and devoid of all fat and sinew and that the investment of just an hour or so a week can produce better bread than you could ever buy pre-sliced and stacked sky high on the supermarket shelves. Having been a pretty fussy eater as a littler loaf, I imagine that my children may take some persuasion with certain foods. Unless they inherit their father’s omnivorous approach to anything edible, they may need a little coaxing to try some of more weird and wonderful flavours that are now a part of my everyday eating life. I’ll also need to be careful about how much sugar they consume, reigning in my sweet tooth (ok, teeth, there’s definitely more than one hiding away in there) until they are a little older in order that they have the best start in life – no rotten teeth, hyperactive behaviour, early onset diabetes . . .
Ok, so I’m being a little alarmist, but I do want to make sure my kids’ palates aren’t completely deadened by the onslaught of sugar from an early age. When we were growing up I remember one of my favourite tea-time treats being ice lollies made with our Mum. Consisting of nothing more than a little orange juice or homemade lemon squash frozen in a simple plastic receptacle, they were sticky, sweet and delicious: the taste of summer. No cream or chocolate or copious amounts of sugar, just good, old fashioned fruity flavour. Don’t worry. I’ve said above that those children don’t yet exist, so this post is still an unashamedly indulgent exercise in sugar, chocolate and cream. But it does take one lesson from those early childhood experiences: the excitement of eating anything on a stick. Having bought some little silicone Magnum-style moulds online (a big thank you to Zita for your advice on Twitter! 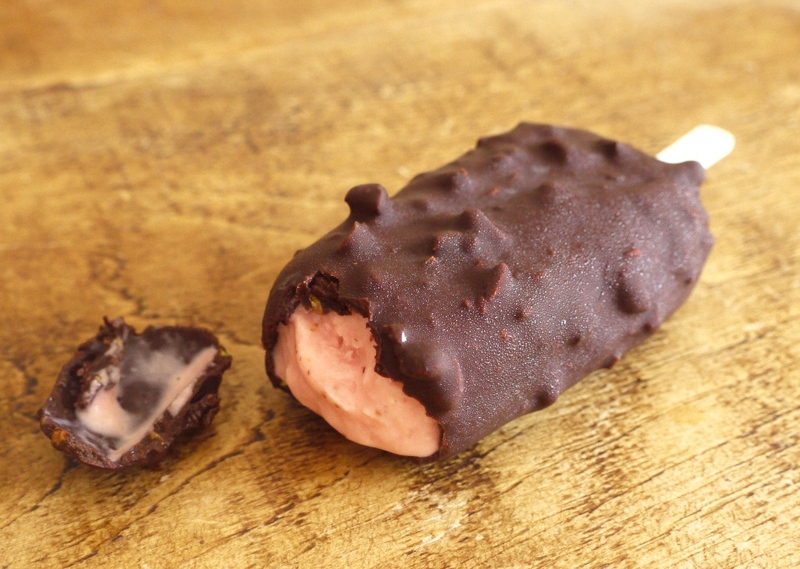 ), it filled me with pure childish joy to fill them up with ice cream, wait for them to freeze then carefully remove, cover in chocolate and slowly lick from the stick. If you don’t have ice cream bar moulds, you could freeze this ice cream as a block then slice into bars. I’ve done this before with my homemade Snickers ice creams and, while it’s a little messy, the results are still delicious. For the coating, I’d originally intended to make them all with white chocolate, but devoid of cocoa solids and high in fat it can be a slightly tricky ingredient and, after my first batch seized when melting, I was left with only enough to cover half the bars. Dark chocolate is almost as delicious, but if you’re looking for a true summer strawberries and cream-type flavour, I’d suggest persevering with the white. It can be done. 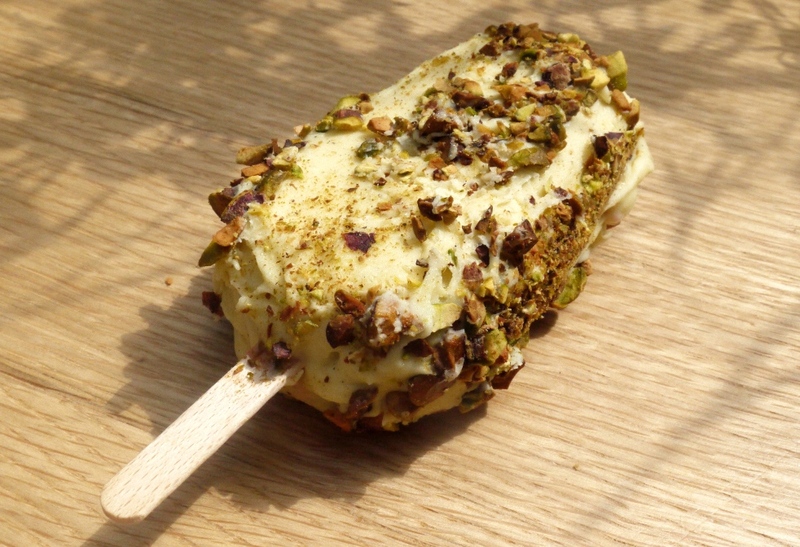 I included toasted pistachios for crunch against the creamy chocolate and ice cream, inspired by the flavours in this lovely post. Stirring them through the melted chocolate results in a more even finish, but it also looks lovely if you scatter the bright green shards over the top – I tried both as you’ll see from the photos, but it’s absolutely your call. 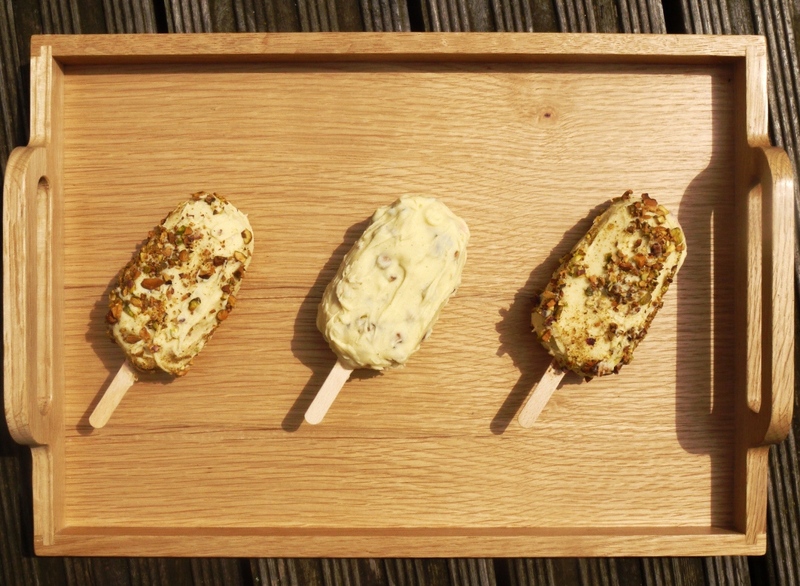 So here they are, my very first attempt at ice cream on a stick. Creamy and chocolaty with the crunch of nuts, these summery bars are enough to satisfy the sweetest of teeth. Just keep them out the way of any children – for them it’s ice lollies all round. In a Magimix or blender, whizz the strawberries and lemon juice until liquid and smooth. In a small mixing bowl, whisk together the egg and sugar until pale and smooth. In a saucepan, combine milk and cream and bring to a simmer, taking care not to burn it. Pour this hot milk and cream over the egg mixture, whisking constantly, then stir in the strawberry purée. Continue to whisk over an ice bath until cool, then leave to chill in the fridge overnight. Churn the ice cream according to your manufacturer’s instructions, then transfer into 8 silicone ice cream bar moulds and freeze until solid (at least four hours, preferably overnight). Alternatively you could freeze in a square container, then cut into bars once solid and continue with the recipe below. Melt the chocolate, butter and corn or glucose syrup in a bain marie over a low heat until melted and smooth. Stir in the chopped toasted pistachios and set aside to cool slightly. When ready to dip your ice creams, line a tray with baking parchment and place it in the freezer. Remove the ice cream bars from the freezer one at a time and dip carefully in the chocolate mixture, returning to the prepared baking parchment as quickly as possible. The chocolate will set pretty quickly, so you should be able to eat them within 30 minutes or so. *This is my recommendation, although you’ll see from the photos that I’ve not quite perfected my white chocolate coating recipe yet – it was a little too thick for my liking. Oh wow! Those look amazing. And as for kids, if you bring them up on good food, they’ll grow up appreciating it – and then when they’re grown-up like mine they’ll cook you fabulous meals too! Oh wow, these look absolutely amazing, and definitely like a Magnum. I’d love one of these right now. Where did you get the moulds from? I think I need to get some Magnum-style moulds too … these look fabulous!! I love homemade ice-cream. “I want my children to understand where food comes from, how important it is, to realise that meat doesn’t just arrive pre-packaged and devoid of all fat and sinew and that the investment of just an hour or so a week can produce better bread than you could ever buy pre-sliced and stacked sky high on the supermarket shelves.” <- LOVE THIS. and if that's not proof that you're an awesome mum yet, you made "magnum ice cream" from scratch!! These look seriously amazing… you will have some very happy children one day:-) I used to love the Good Humor bars… so bad for you but so delicious. This really is the perfect summer treat. And if a child were to eat it, I would be a lot better for them than some ice cream bar packed with ingredients not even the parent could pronounce! My mother is the ultimate fan of ice cream bars, and she only gets them with nuts. This would be her dream dessert. This looks absolutely gorgeous! Great post and all very true. It’s better to make these things yourself so you know what you eat. I want those pop moulds too! The Single Gourmet & Traveller – that’s what I’m hoping! Eat Little Bird – they are so much fun to use. Shuhan – aw, thank you. Glad you like the post. The Spicy Saffron – thanks. Sacha – that’s so true – just good, wholesome ingredients and so much more delicious than anything shop bought. Your Mum has good taste, I love anything with nuts too! Regula – aren’t they cute?! Yum! I’m craving after some sweets. This would be perfect right now! This is a lovely post–I feel the same way about my (maybe?) future children and food. Also, these ice cream bars look fantastic! How wonderful, I am so pleased they turned out well. This is definitely an ice cream I will be trying as my kids love strawberries. They are now good eaters too and I think this is because I cook all their food from scratch other than buying fish fingers and crinkle cut chips for a treat! Looks amazing. Would you mind providing a link to your moulds? There’s a lot out there and looking for a good recommendation! Oh my goodness, If i wasn’t feeling quite so grumpy about the weather today having been sat in the rain by an outdoor ppol watcing my daughter’s ‘swimming gala’ i would be ridiculously excited about these, and rooting around for ice cream instead of commenting. Instead, we had chunky chorizo soup for supper followed by ground rice pudding, and I cannot contemplate anything ice cream wise at present. However, when I can, I will be back for these. Zita – I could eat one any time of day 🙂 And thanks again for the mould advice! Glamorous Glutton – do give them a go, and enjoy! Jereme’s Kitchen – they’re perfect for summer. Laura – thank you. I remember strawberries being a big favourite as a child, especially in ice cream! Baking Beardy – have a look on the Squires Kitchen website, the brand is Silikomart. Enjoy! Recipe Junkie – oh dear, I know, this weather has been very depressing! Frugal Feeding – I’m sure I’ll get round to trying a double caramel one soon 🙂 As for the weather, I eat ice cream all year round, I don’t think you need to wait until it’s hot! Amrita – that sounds incredibly restrained of you! Good to find somebody else who has yet to have children, but already knows what they’re going to feed them and they will educate them when they do eventually arrive. Oh, and I so want all of the above – they look de-lish! Urvashi – ah, I still quite like an almond magnum every now and again! Lianne – me too, toasted pistachios are heavenly. I love these! 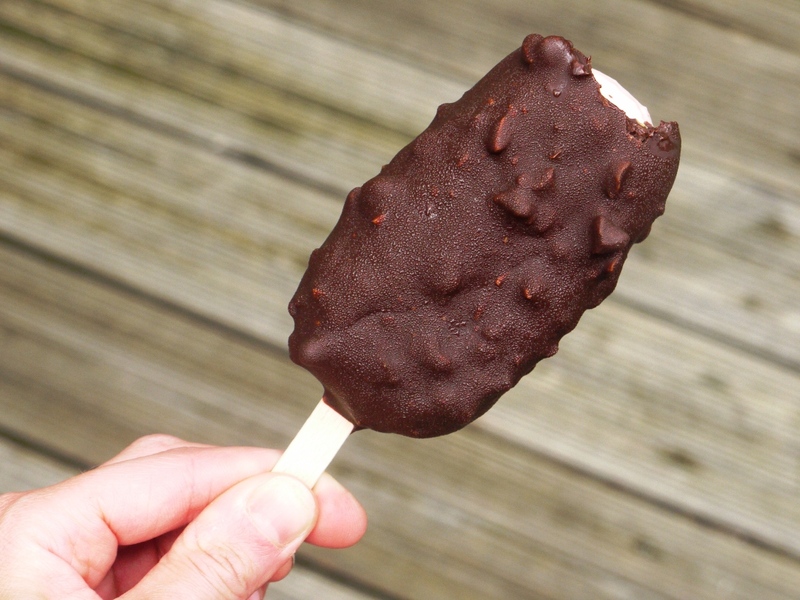 Magnums are definately my favourite cool treat and to get to make your own… I bow in admiration! My goodness this looks good. Wow! heaven on a stick! Kate – haha, thank you! Cake Boule – my thoughts exactly! Pistachio is my husbands favorite! With his birthday coming up next week, I may just try these. Thanks for sharing – the pictures look incredible delicious! I was wondering from the beginning of the post how you got the shape! And I agree with your point of view and am trying to do the same with my children. These looks wonderful! My mom used to make us popsicles too with just fruit juice. We loved them! Your future kids are already lucky, lucky, lucky to have a Mom with dessert, baking and pastry skills that are mind blowing..even if you do limit their consumption of amazing ice cream bars like these! 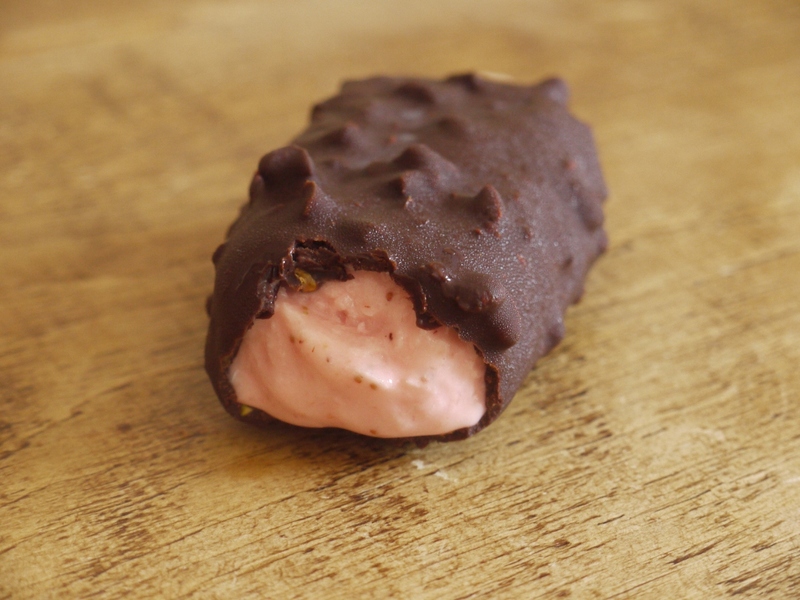 I love the toasted pistachio – strawberry ice cream combo enrobed in chocolate,,wow! Hope you’re having an amazing time in Tuscany..can’t wait to hear all about it! Nuts About Food – the moulds are fab, definitely recommend them! Had the pistachio in Italy wonderful Why is this not in the US ??? ?